Posted on Sat, Mar 10, 2012 : 1:57 p.m.
Bradley Cross loves beautiful things. He’s spent a lifetime making them, listening to them, collecting them and preserving them. Cross is best known locally as owner of Harmony Hollow Bell Works, one of only three bell-making companies in the United States. He’s also a world traveler, collects works of art and rare South American textiles and lives in one of the coolest houses in Ann Arbor. 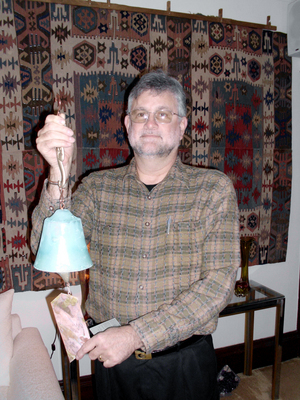 Bradley Cross holds one of the custom made bells made by his Ann Arbor based company, Hollow Bell Works. He grew up in Ann Arbor hoping to become a conservationist. Toward that end, he earned a bachelor’s degree at the University of Michigan in forestry/outdoor recreation in 1972 and a master’s in wildland management in1982. Between those degrees he spent three years in Colombia with the Peace Corps, which was the start of his long-standing love affair with South America and its people. It took him seven years to earn his master’s degree because he kept seeking out consulting gigs all over South America. After graduating he continued to consult in South America, trying to spread the word about conservation and sustainability. Meanwhile, Bradley’s brother, Jeff, had started Harmony Hollow in 1969 in Arizona, on a ranch where he also hosted a commune. In 1977, Jeff went missing. Bradley went to Arizona to temporarily help run the bell business and to monitor the investigation into his brother’s disappearance. That time changed Bradley’s outlook on the cosmos. The sheriff's department in Maricopa County suspected foul play and had a suspect in the case, but couldn’t find him. With the Cross family’s permission, the sheriff brought in a psychic to help find the suspect. Using only a piece of Jeff’s clothing, his birth date and name, the psychic was able to describe the lay of the land at the ranch, the inside of a partially finished house and the people living there. That made a believer out of Bradley. "It showed me there is another level of reality that exists," he says, "and some can access it." Still, the suspect was never found. Eighteen months after he went missing, Jeff’s skeleton was discovered in the Arizona desert. He’d been shot. His killer still hasn’t been found. After six months in Arizona, Bradley had returned to Ann Arbor and his consulting business. He moved the bell business to Ann Arbor in 1978, and it continued to operate on a small scale, but Bradley was still a dedicated conservationist set on preserving the world's beauty. His professional landscape changed permanently in the early ’80s, however, when Ronald Reagan was elected president and he “zeroed out” conservation in Third World countries. Bradley’s consulting dried up shortly thereafter. It proved fortuitous. Bradley had met his future wife, Nancy, in 1982 and he wasn’t enjoying his long consultancies away. Now he had a great reason to concentrate on the bell business. Instead of preserving beauty, he started creating it. He was quickly rewarded. Using his brother’s designs and his own marketing ideas, Harmony Hollow expanded immediately. In fact, it grew 30 percent to 40 percent per year throughout the rest of the 80s. The bells were being sold in such stores as Hudson’s, Marshall Fields and Dillard’s; at one point, 27 people were employed making bells in Ann Arbor. Bradley is quick to point out that Harmony Hollow sells bells that ring, as opposed to clink, and he made sure all his vendors understood that. The difference? "The length of sound decay," Bradley explains. His bells maintain their resonance because they're designed to, through their height, diameter, wall thickness, the weight of the clapper, etc. Business slowed in the early ’90s, when much of the wholesale gift business was outsourced overseas and many of Harmony Hollow’s biggest accounts dried up. Quality was taking a back seat to profit margin. Bradley scaled down the business and refocused on art shows. A little more than a year ago, Harmony Hollow got out of the wholesale business altogether. Over the past 30 years, Bradley and Nancy have taken their bells to hundreds of trade shows all over the U.S., where they’ve made a point of collecting the most interesting art pieces they’ve run across. Their home today looks and feels like a very comfortable museum, full of the works of amazing artisans. Included are the textiles that Bradley first started collecting in Colombia, then Ecuador, then Peru, then Bolivia, where the best were available and inexpensive. "I was there when TV had just arrived," he explains. "The Native American Bolivian wanted to go to the city and look and act Western, sell the poncho, get jeans, and take aspirin, not traditional herbs. I knew how long it took to spin, dye, weave these incredible textiles and here they were being chopped up for tourist purses, or adornments on jeans. I hated to see that so I collected and saved (the ponchos). I had a one-man show of some of my collection at the Art Museum U-M Dearborn a few years back." In recent years, Bradley and Nancy have started a boulder collection. When they see a huge rock with an especially interesting pattern, they've been known to buy it and move it to their yard on Second Street. Sometimes, that has required a crane. But, hey, beautiful objects come in all sizes. Kyle Poplin is publisher of The Ann magazine, which is inserted monthly in many copies of the Sunday print edition of AnnArbor.com. He’s also searching, through this column, for the most interesting person in Ann Arbor. If you have anyone in mind, email your idea to theannmag@gmail.com.